This new book was a natural for Bob Wechsler. He is an avid collector of Jewish sports cards and is one of the leading historians on Jews in sports. His first book, Day By Day In Jewish Sports History, is an invaluable resource, not to mention an entertaining read. Wechsler combined both of his passions for The Jewish Baseball Card Book. The book now is on sale for $49.95. 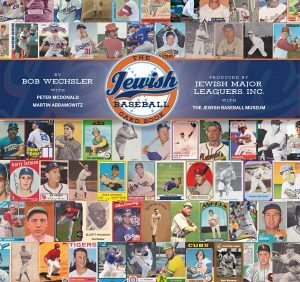 Published by Jewish Major Leaguers Inc., and Jeff Aeder, founder of JewishBaseballMuseum.com, the coffee table book shows a unique perspective of Jews in the game by using original cards for each of the 169 Jews who played in at least one major-league game from 1871 to 2016. It truly is fascinating to not only see the evolution of the cards, but also almost a real-time depiction of Jewish players. And if you’re a fan of baseball cards, like I am, you will be riveted looking at the cards. Actually, it was (Jewish Major Leaguers Inc. head) Martin Abramowitz’s idea. I was involved in helping Martin with his organization’s Jewish Baseball Cards commemorative sets. Martin had the idea of putting out a book that would show what all of the players’ real cards looked like. Having been a collector of Jewish sports cards, it was right up my alley. How did you get interested in collecting Jewish sports cards? I collected a lot of cards as a kid from 1956-61. Of course, everything got thrown out, and I never gave baseball cards much afterthought. Years later, while working as a newspaper editor, a lot of sports-themed books and promotional material was sent to us to review. One day we received a pack of 1989 Pacific Legends baseball cards in the mail. 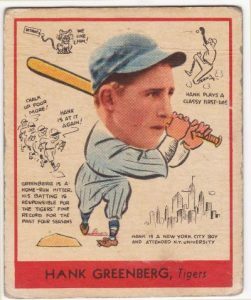 There were 10 cards, and two of them were of Jewish players: Ken Holtzman and Hank Greenberg. It intrigued me. I thought it would be fun to go back and try to collect the cards of every Jewish player. I started collecting one of each player, and then decided to try to get all of them. Ninety-nine percent of the images in the book come from my collection. So why a book on Jewish baseball cards? It really chronicles the history of baseball cards. It shows how they began as inserts in packs of tobacco, and evolved into vehicles for companies to sell candy or chewing gum. Regional issues were also sponsored by dairies, bakeries and meat products. Sy Berger introduced what is now considered the “modern” baseball card with Topps’ first major issue in 1952. From a player perspective, you can follow Jewish players chronologically beginning with Lipman Pike in 1871. You can see when they broke in; how many Jews were playing at a particular time. Players’ career stats and highlights are included. The book also has several sections beyond just showing the cards. Explain how you broke those down. Following the individual player pages is a section on the five players who converted to Judaism before or during their playing days, and three who converted after they retired as active players. Galleries of Topps (1952-2017) and vintage Bowman (1949-55) cards show the year-by-year progression of those popular brands. There’s also a section of cards of Jewish players issued in Japan, and during the winter leagues in Cuba, Venezuela and Puerto Rico. Finally there is a checklist of all cards issued for active Jewish players up to 1988 — the year when the market became flooded with cards from numerous manufacturers. There is a fun section with error cards. What are some of your favorites from that section? One of the most valuable “Jewish” cards is a 1931 Exhibit Supply Co. 4-in-1, which depicts Babe Ruth, Lou Gehrig, Lyn Larry and Jewish infielder Jimmie Reese, all of the Yankees. However, the Reese photo is actually that of Andy Reese of the New York Giants. A 1991 commemorative set of all previous New York Mets players has a photo of Hobie Landrith on Joe Ginsberg’s card, and vice versa. Current Detroit Tigers second baseman Ian Kinsler’s 2005 Topps Total rookie card has a picture of Texas Rangers pitcher Erasmo Ramirez. What is the most difficult card you acquired? Probably Morrie Arnovich’s 1939 Father & Son card, issued by a Philadelphia-area shoe store. Arnovich was an outfielder for the Phillies. 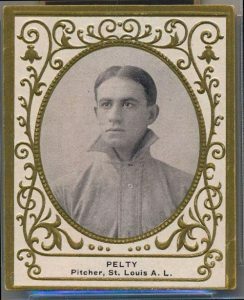 The 17 cards in the regional set were all Phillies or Philadelphia Athletics players. My most sought-after card is the 1955 Cal Abrams issue that came attached to packages of Baltimore-area’s Esskay hot dogs. Yankees pitcher Herb Karpel’s 1949 Hage’s Dairy card, a Pacific Coast League issue, also is a tough one. That there’s more than just two Jewish baseball players. A lot of people still think it’s only Sandy Koufax and Hank Greenberg. 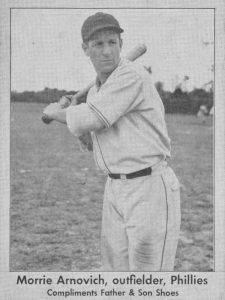 I would like for readers to get a little sense of history about Jews in the game and how their baseball card designs have evolved. It’s a coffee table book. You don’t need to read it from cover to cover in one sitting. You can just turn to a page and remember players and cards from your childhood.